The mystical country of Myanmar is home to thousands of ancient temples and pagodas, often concentrated in a relatively small land area. These places of Buddhist worship are also leading tourist attractions for their architecture, timeless beauty and historical significance. Shwedagon Pagoda is a well-known pagoda found in the major city of Yangon (formerly Rangoon, the old capital of Burma). The name means “Great Dragon Pagoda” in English. It is a 99-meter high golden pagoda and studded with more than 5,000 pieces of diamonds and 2,000 rubies. It is one of the most ornately designed pagodas in the country, as well as most revered for what are enshrined therein. Shwedagon has four entry ways leading up to the Singuttara Hill. At the entrance areas, local vendors sell Buddha images, good luck charms, books, pieces of gold leaf, candles, incense sticks, prayer flags, paper streamers, umbrellas and flowers that are common items of worship and offering. Standing as guards at the southern gate are two gigantic statues of a chinthe or leogryph, a mythical lion-dragon. On top of the steps is an image that is said to be that of Konagamana. The pagoda is composed of a basement made of gold-plated bricks, terraces that may only be accessed by monks and men, and the bell-shaped portion whose features include a turban, inverted bowl for taking alms, inverted and upright lotus petals, a banana bud, diamond-and ruby-studded crown or umbrella and a diamond bud at the very top. All the gold plates that may be seen in the main stupa are genuine gold donated by royalty, monarchs and local devotees through the years. 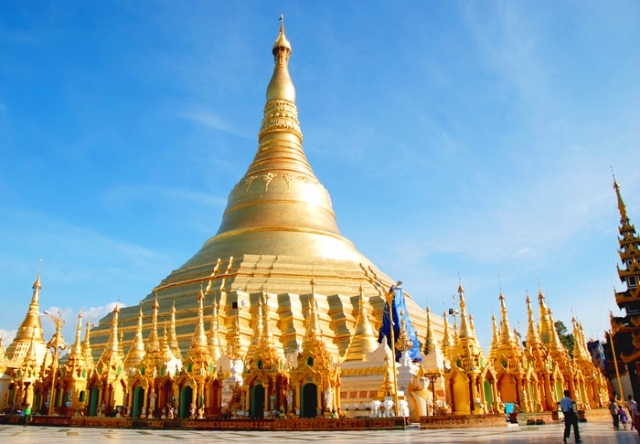 Shwedagon is one of the reasons why Myanmar is often referred to as “The Land of Gold”. Some folk people believe that pagoda is over is 2,500 years old, but archaeologists place the pagoda’s birthday much later between the 6th and 10th centuries. It was built by the early Mon setters during the Bagan period. This period was determined as the beginning of the pagoda based on inscriptions found on top of the eastern stairway that were discovered in 1485. The inscriptions were written in Pali, Mon and Burmese. The laying and gilding of gold began with Queen Shinsawbu’s offering of a gold leaf. The practice continued for centuries until today. The pagoda was destroyed several times by earthquakes and was rebuilt many times as well. The last reconstruction was done by King Hsinbyushin in 1769. In 1824, the British occupied the pagoda and pillaged much of its rare treasures. In 1871, King Mindon Min took control and built a new umbrella for this sacred structure. In more recent history, the pagoda fortunately stood firm and undamaged from the 1930 earthquake that devastated the country. It took a few more decades after it was refurbished yet again after the earthquake in 1970. Today, the Shwedagon Pagoda is a symbol of national identity and pride.